This course shows educators how to implement the researched-based instructional strategies with educational technologies. Various computer and internet applications are presented along with lesson-planning ideas and strategies for every grade level. The book provides word processing applications, organizing software, data collection tools and web resources for teachers to use in various classroom lessons and settings. Educators will apply the book concepts to utilize technology with their classroom instruction as well as develop lessons for classroom implementation. Educators will learn how to effectively use researched-based instructional strategies that work with educational technologies, such as computer and internet applications. Participants will learn which strategies work best for what students will be learning. 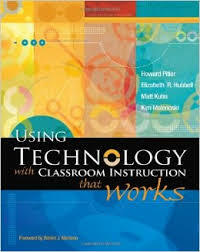 They will also be presented with ideas of how to provide evidence of student learning when using technology. Educators will be presented with word processing applications, spreadsheet software organizing tools and multimedia for lesson planning in classroom applications. Participants will be exposed to web and data collection resources as well as Identifying communication software for educator or student homework practice. Educators will learn how to best use and integrate technology into their instruction and write a research review or develop unit and lessons applying the course content in their classroom instruction.